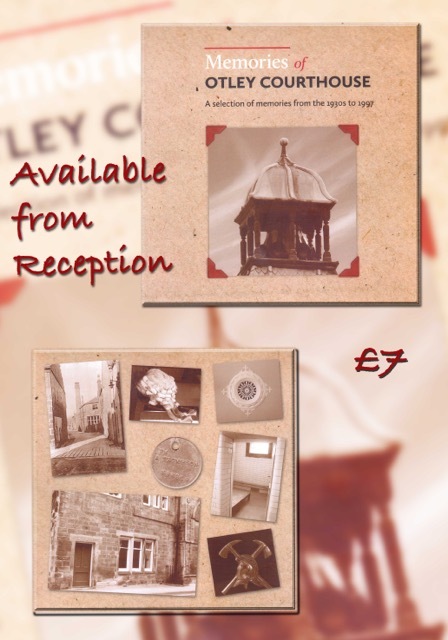 The ‘Memories of Otley Courthouse’ project has interviewed and recorded the memories of people who had connections with the Courthouse, Police and old Fire Station until the courts closed in 1997. The recordings have been edited for inclusion on the website, in a book and on new display boards in the Courthouse. This work has been funded by the Heritage Lottery Fund, through a ‘Your Heritage’ Award. These Awards are for local and grassroots heritage activities, of which the recording of oral history is an important part. Over 20 volunteers have donated many hours of their own time to carry out the project. The book and display boards were launched on Saturday 8th December 2012. The Courthouse website contains extracts from the interviews, with audio, text and pictures. To access these recordings on the website, please follow the links on this page. The success of this project means that there are many more interviews to be carried out, as well as further work in editing and photographing interviewees! If you would like to help with this fascinating work uncovering the past history of buildings and people, who were so important to Otley’s history, please contact the Courthouse on 01943 467466 or admin@otleycourthouse.org.uk, giving your name and contact details. One of the heritage volunteers will then get in touch with you. Rachel O’Connor was a reporter for the Wharfedale and Airedale Observer newspaper between 1966 and 2010. She covered court cases at Otley Courthouse every week until it closed in 1997. Rachel guides us around the Courtroom and cells giving us a fascinating insight into how business was done and inmates facilitated. They were policing the town, Otley town centre but there were also some beats, some outlying beats which brought in Pool, Fewston and then out towards Burley in Wharfedale and Bramhope. They were the outside beats. And then inside the town itself, there was the town Beat, which was No 1 beat. Outside that was the No 2 beat which they went further out into the housing estates roundabout Otley, like at Weston or down Pool Road. But the actual Town Beat was just the town, the town centre so it was bordered by Boroughgate, Kirkgate, Bradford Road and up towards Leeds, as far up Leeds Road as far as the Auction Mart. Every half hour we had to be by a telephone box in order that the office could contact us should they want to send us anywhere. You needed to be there five minutes before and five minutes afterwards so that covered a quarter of an hour, and then you moved on to the next point. The first one was outside Moss’s shop in the market square. Another one at the bottom of Station Road. There was one up Leeds Road by the Auction Mart. There was one down Pool Road by the pub and Mechanics Hall by the Maypole. Then there was one up Bradford Road, by the traffic lights. Then there was one down by the swimming pool down in the park. Then there was one in Weston Road. We had to alter these points daily. When you went on duty, you signed on duty they told you where the points were. So you had half an hour to walk there. You walked everywhere and sometimes it was quite a long walk. From Leeds Road to Western Road was a fair walk and then your next one might be Pool Road so in a night you covered quite a few miles. You had to check the property. As you were walking down the road you had to check the door system, on nights. When you first came from Training Centre, you were on nights until you got used to walking about the streets in uniform,(that was the thing) plus the fact you had to get to know the place. Now the first night I was on nights, Sergeant Preston said, “You’ve been a cadet haven’t you, you know things, well I’m off at two, you’ve got the town to yourself.” I was in charge of Otley. There was someone in the office if you got stuck like. So I thought, I’m all right here then. So I just wandered round Otley. So my father was an auxillary fireman. If the fire broke out when the firemen were at home, there was this bell system at the top of the stairs, which would ring out if there was a fire. And then of course Dad would have to jump on his bike and head off down Billams Hill. If you attended, one of the first that went on the first fire engine you would receive rather more money than if you got the second one. Well I was looking at this, the National Registration Identity Card which Dad had and it gives his details on it. But on the back it says ‘I certify that the person to which this identity card relates is employed in or under is a member of the National Fire Service. And that was dated the 9th July 1943. And it was signed by Mr King, Ivor King, who was the station officer at that time. There was a very tragic fire in Otley where two children were killed. And Dad was very ultra careful about fire. We had an old fashioned Christmas Tree. It had little candle holders on the end of each branch and we had these candles stuck in, but they were never lit. No. 10 Wesley street where we lived was on the opposite side of the road to the police station and I said there were the petrol pumps for the police cars but there were also stray dogs locked in kennels until they could be taken elsewhere and they were yapping all day and all night. We had to keep these dogs 7 clear days before they were disposed of and I know it caused a lot of heart break for various people in the area when the dogs were yapping all night as well as our family as we lived on the premises. In fact one of the bedrooms in our house and the bathroom was over the Chief Inspector’s garage and he used to leave the door open and the wind was howling through, the room was extremely cold, the dogs were barking and sometimes it was so cold in that house in the winter that my eldest boy used to sleep in the front room – and of course being a poor copper we only had lino on the floor – no carpets, and if he heard the road sweeper go by in a morning about 5 o,clock, he used to come out early mornings to sweep the streets, he used to pitter patter across those linoleum floors climb up on a box in front of the window and scrape the ice off the window to look out to see the road sweeper go by. The bathroom was over the top of the garage and this cold room and if you put hot water in the bath you had to be quick and get in and get out because the water got cold very quickly. It was a free standing bath, and you couldn’t spend much time in there, and a very big one and it was in a very large room – it wasn’t conducive to laying there relaxing as we do now. My memory of the Courthouse is that it was in fact a friendly place for people other than criminals I suppose, because it was local. And the beauty of the local court was that the magistrates had a very good idea of the circumstances in which people who appeared before them where living. The solicitors knew the general area: they knew the Police, they knew the Probation Service and so I think that a very much closer understanding of the people that they were dealing with existed. I remember well, the chairman of the magistrates would say to a defendant before he sentenced him “Have you got anything to say?” and question him about his background. He probably knew the background of many of the farming people and the locals, whereas nowadays, one is not so intimate. There isn’t that advantage which would lead to an appropriate sentence. The other thing that stands out in my mind is that the solicitors came to know the magistrates and their general attitude to various things, and their local knowledge. And also the police, so that the police could seek advice from solicitors in a non-formal way in relation, for instance, to the work of police officers, which all led to a very intimate and correct, and sound dispensation of justice. We had a time slot, it was a nice sunny day and we arrived, with Liz and my son and we came into the courtroom, the big courtroom and the judge was sitting up on his seat, on the bench basically, by himself, but it was raised up high, but his robes and his wig on. He was a very nice man, had a little word with us all and then said, and I remember this, he said this is all a bit formal for such a happy occasion, I’m used to dealing out serious things from up here, so this is a happy occasion, so we won’t do it formally here, we will go in the robing room so we came into this room, it was dark, I can’t remember what the decorations, I think there were pictures around, but I do remember a huge big shiny table, in the middle of the room with lots of chairs round it, he sat at the head of the table in a big chair with some sort of carving on the top of it. And we sat round the table, everybody, and then because Lizzy was still only little she ended up sitting on the table and crawling about, because it was very shiny, and he took his wig off, and she actually grabbed it and put it on her head and that was just such a lovely moment and we were all, it was just such a happy day, really. I do remember signing bits of paper, and then, he just said congratulations and we all shook hands and that it, it was over, in about 10 mins really. And it was the beginning of her life with us, which has just been, nothing but joy really ever since. … about the working life of her mother Miranda Turner (1906 – 1984). Miranda Turner worked at Otley Police Station as a cleaner, from 1938 to 1968. ‘My mother went at 6 o’clock in the morning till 10.